Indians set tyres on fire, vandalised petrol stations and blocked roads and railways Monday as opposition parties led nationwide demonstrations against rising fuel prices. 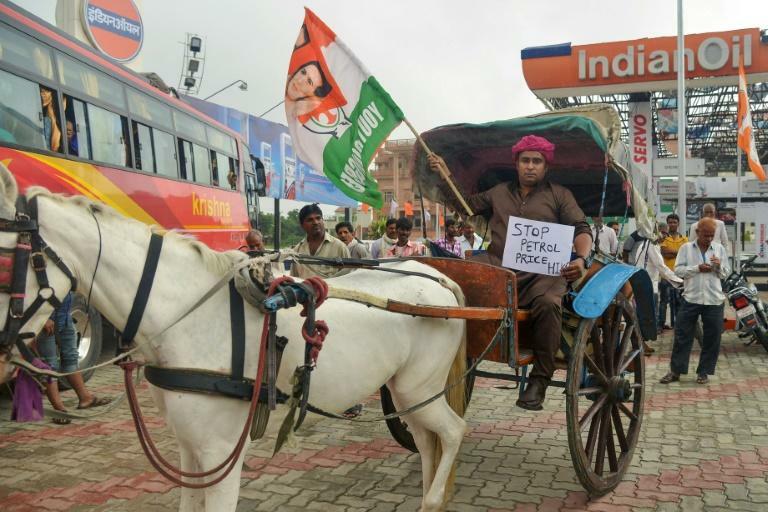 The protests were called by the opposition Congress party led by Rahul Gandhi, who is looking to challenge Prime Minister Narendra Modi's Bharatiya Janata Party (BJP) in general elections expected in early 2019. "Ever since the BJP came to power (in 2014) fuel prices have been going up. Prime Minister Modi has failed to deliver on his promises to the people," Gandhi, 48, told a crowd in Delhi. "Your money is being looted... Hatred is being spread. Wherever you see, Indians are fighting one another," said the scion of the long-powerful Gandhi-Nehru dynasty. Police and demonstrators scuffled in the central state of Madhya Pradesh -- currently held by the BJP, but which goes to the polls this year -- as protestors attacked a petrol station, television pictures showed. Similar incidents were reported in the financial hub of Mumbai, in Modi's home state of Gujarat and in the eastern state of Bihar. India's rupee hit a new record low of 72 to the dollar last week as emerging market currencies suffered losses. This has made India's massive imports of oil, priced in dollars, more expensive. Further strain on the economy has came from the government's surprise removal of vast quantities of cash from the system in 2016, and from a drive to simplify the tax code launched in 2017. A Mood of the Nation survey of 15,000 respondents in April and May showed Modi's popularity rating dipping two percentage points from 2014 to 34 percent while Gandhi's rose eight points to 24 percent. In a speech late on Sunday, Modi was in bullish mood nonetheless. "We have started our journey (towards general elections) with confidence. We enjoy the confidence of 1.25 billion people of India," he said in the capital. "We do not see any challenge (from the opposition). Their allegations are based on falsehoods and web of lies... When they were in power they were a failure, and they are a failure even when they are in opposition."